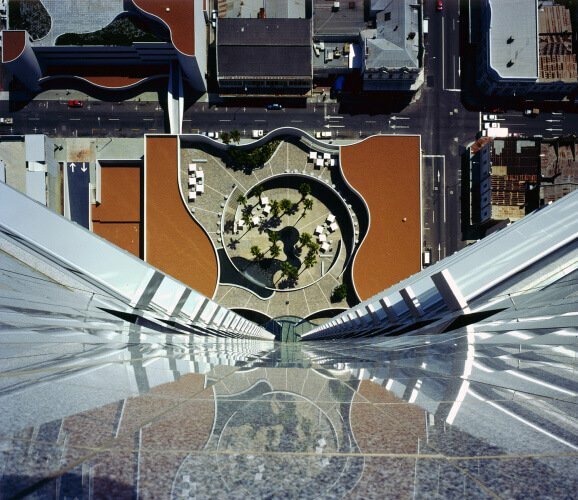 At Risk: QV1 Building, St Georges Terrace, designed by Harry Seidler & Associates. QV1 Building, St Georges Terrace, designed by Harry Seidler & Associates completed in 1991. The Seidler building in Perth is slated for major redevelopment and refurbishment by Hassell Architects of its plaza and fountains, to make way for more ‘useable’ space which includes a hemispherical roof with a central open oculus. Again, modern landscaping is sacrificed without any heritage protection.